If you’ve been around here for long, then you probably know that I have this constant love/hate relationship for my home state and current residence: Florida. You get used to seeing roaches and giant bugs, everywhere. You develop a deep and almost fearful respect for thunderstorms and the lightening they can produce. You know that hanging out on the beach or at a park for longer than a couple of hours during the summer months (100°+ temperatures + extreme humidity) will result in buckets of sweat, a sunburn, frizzy hair (frizzy might be an understatement), and dehydration. Maybe Florida isn’t that extreme, and maybe I’m over-exaggerating just a bit. But one thing is true: Once you’ve lived in Florida, you certainly develop an understanding of what the words hot, humidity, thunderstorm, roach, and too much sun truly mean. Of course, living in Florida (at least on the West Coast of Florida) also has major perks, like being minutes from the water and gorgeous beaches. The sad fact is that we don’t make it to the beach as often as we’d like, just because life is busy with school, work, and just surviving the daily tasks of parenthood ;). So when it comes time for a family vacation, there are two options that always top our list for Florida vacation spots: the beach and Disney World. One is completely relaxing and the other, well, I’ll just let you imagine what Disney World is like in the summer. For several years now, we’ve spent a week on Anna Maria Island for our family vacation. Anna Maria is very quaint (think: not touristy) and the beaches are absolutely gorgeous (think: white sand and clear water). 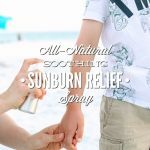 As we prepared for our beach vacation last month, I purposed to be extra prepared this year with sun protection, so I packed long sleeve bathing suits for the kids, hats, a large beach umbrella, and sunscreen (I purchased BeautyCounter’s sunscreen this year). I knew, even with the extra sun protection, that our skin was sure to get lots of intense sun exposure. 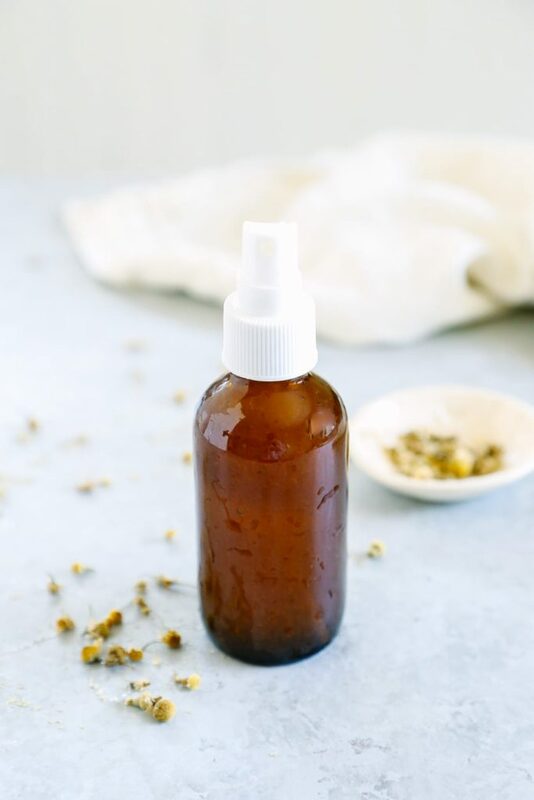 With this in mind, I whisked together a few soothing ingredients from my DIY cabinet to create a soothing sunburn relief spray: green tea, chamomile tea, aloe, apple cider vinegar, and lavender essential oil. Within two days of our vacation my sunburn relief spray was already being used. Because sometimes life happens and you don’t realize that you should have applied more sunscreen 30 minutes ago, or I missed a major spot of skin when I applied the sunscreen. #Yikes! We kept the all-natural sunburn spray in the fridge the entire week of our vacation and brought it out each night after showers. The cool mist helped soothe our sun-parched skin and, I believe, also helped keep our skin from any crazy peeling that usually results from getting too much sun. I was so happy with the spray that I posted my recipe creation over on Instagram, and now I’m sharing this simple spray here on the blog. Green Tea: Green and black tea contains tannic acid that may help to soothe a sunburn and reduce redness. Green tea also contains antioxidants. I’ve also read about people using straight-up (cooled) black or green tea directly on sunburns. Chamomile Tea: I didn’t actually use chamomile tea bags, but rather, loose chamomile flowers. You’re welcome to use either one. 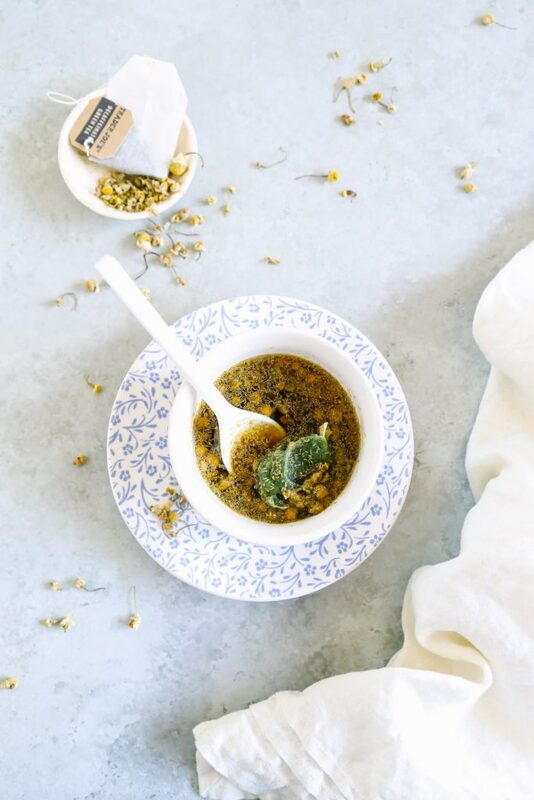 Thanks to its antioxidant and anti-inflammatory properties, chamomile may help to relieve inflammation, and helps soothe the skin. Aloe Vera: There is no end to my love for aloe vera in skincare products. The American Academy of Dermatology recommends aloe for treating sunburns, and there’s a good reason why. Aloe is incredibly soothing and healing, so it’s ideal to use for skin that’s been exposed to a bit too much sun. Aloe vera is also moisturizing, which helps keep skin from drying out and then peeling. When purchasing aloe vera gel avoid the bright green variety with added artificial green coloring. Real aloe vera gel should be completely clear. 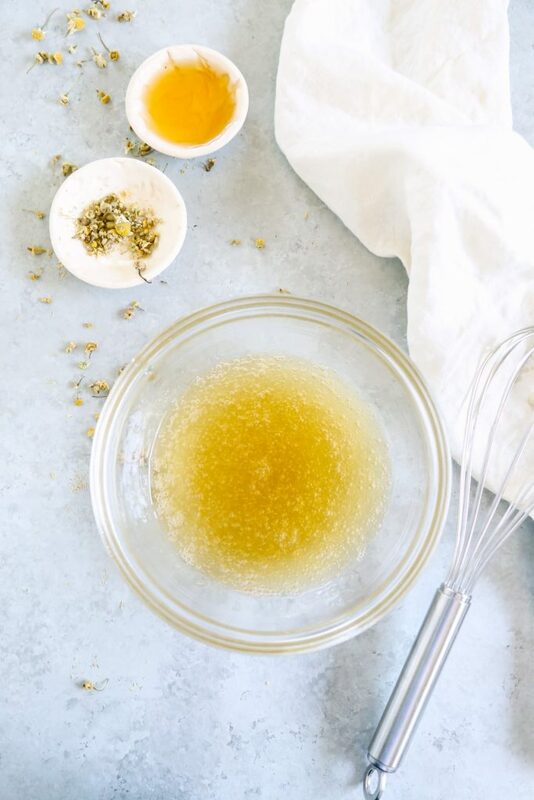 You could also use fresh aloe vera gel in this recipe. I prefer to use Real Aloe, which is the brand I keep on hand to make my homemade facial cleanser. 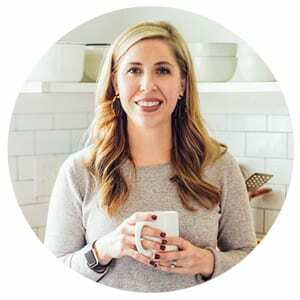 Apple Cider Vinegar: I decided to add this ingredient to my spray after reading that apple cider vinegar may help neutralize a sunburn. Since I didn’t want to bring a bottle of apple cider vinegar on vacation, I added a tablespoon of vinegar to this sunburn relief spray. I recommend skipping this ingredient if you don’t like the smell of vinegar. 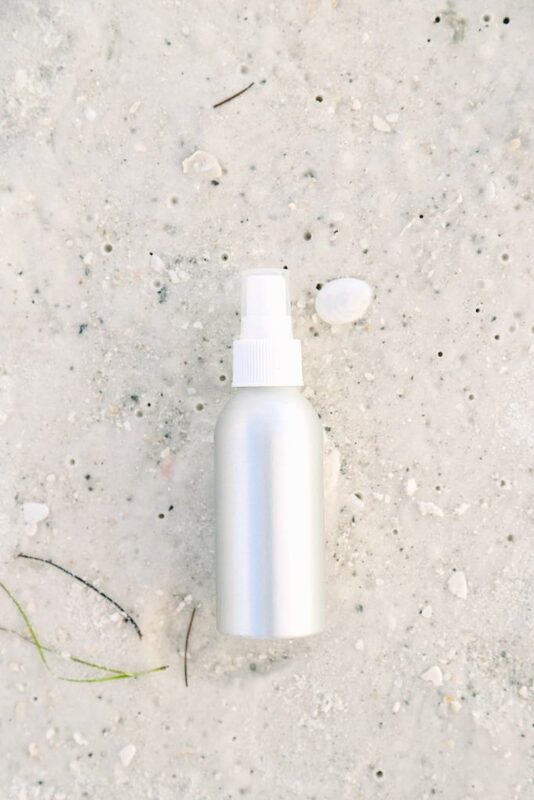 Lavender Essential Oil: I added lavender essential oil to this spray to help heal our sunburns. 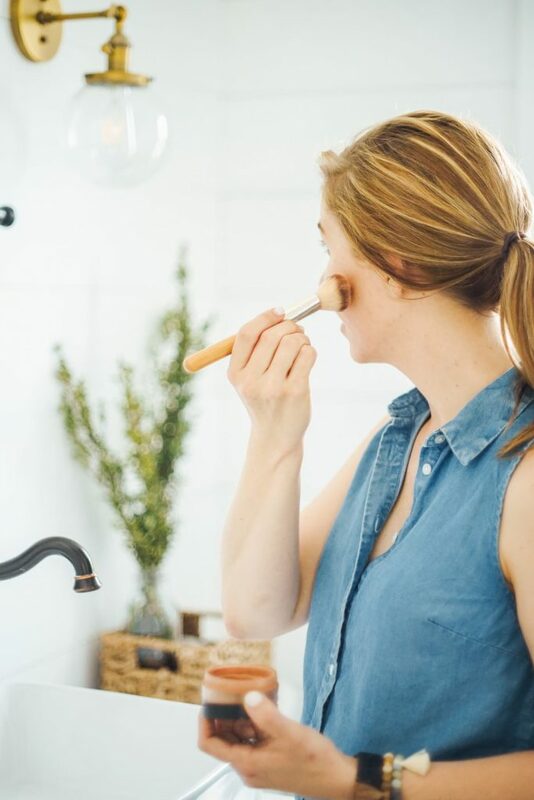 The scent of the oil is canceled out in this spray by the overpowering scent of apple cider vinegar, so the oil is added for its soothing properties versus fragrance. The cool mist helped soothe our sun-parched skin and, I believe, also helped keep our skin from any crazy peeling that usually results from getting too much sun. 1/2 cup aloe vera gel I like Real Aloe brand. I purchase it from our local health food store. 10 drops lavender essential oil I like Plant Therapy or Aura Cacia. Add the chamomile tea bags, or loose flowers, and green tea bag to the hot water, and steep for 10 minutes. Strain the tea bag(s) (and loose flowers, if using) away from the tea water. I use a cheesecloth when working with the loose flowers. If you're just using tea bags, simply remove the bags from the infused tea. 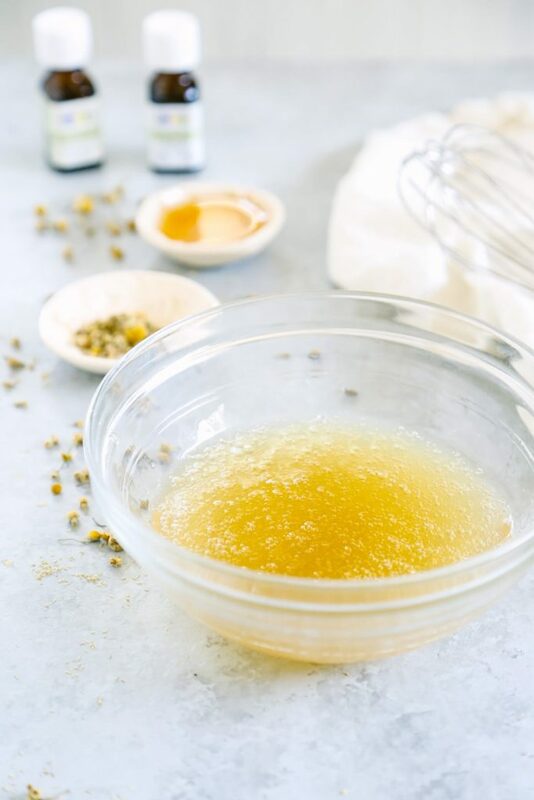 Whisk together the tea, aloe vera gel, apple cider vinegar, and essential oil. Using a funnel, pour the mixture into a spay bottle. Store the spray in the fridge for 1 week. Discard after 1 week. 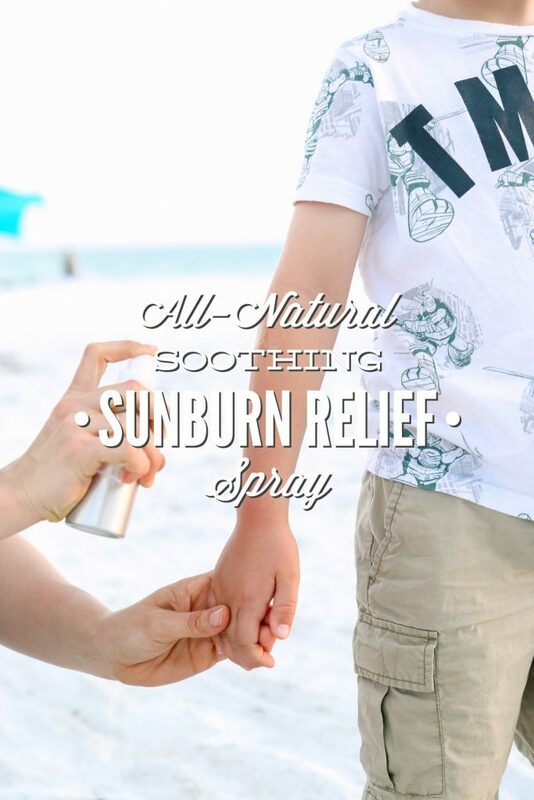 To Use: Shake the bottle, then spray the mixture directly on the sunburn area(s). Massage the spray on the skin. Repeat as needed. If you don’t plan to use the spray within a week then I recommend either freezing the extra, or reducing this recipe in half. If you don’t like the smell of vinegar, which this product definitely has, then I recommend skipping the apple cider vinegar. You could also replace the vinegar with alcohol-free witch hazel. The vinegar scent won’t remain on your skin. You’re welcome to use fresh aloe vera in this recipe since it will be tossed within a week, and it’s refrigerated. I prefer to use my bottled aloe vera from Real Aloe. If you don’t have any aloe vera gel on hand, you may also be able to use 100% aloe vera juice. Orginally, I also added 5 drops of peppermint essential oil to my spray, but since I know many readers may be using this spray on younger children, I decided to leave it out of my posted recipe just to be extra safe. Hey Irena, Love it! Aloe is such an underrated ingredient. Enjoy!! Other things about FL: Highest concentration of venomous snakes in the US; Yellow Flies and Hurricanes. Fun stuff! !